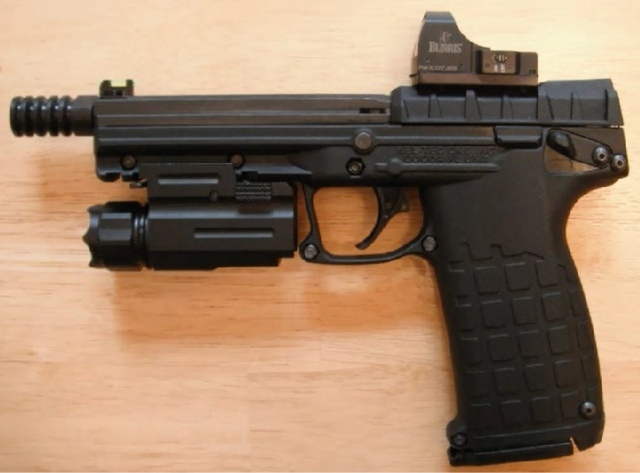 The Kel-tec PMR 30 is a high capacity full size semi auto pistol chambered in .22 magnum (WMR). It was produced in a small quantity in 2012 but is now being reintroduced in 2013 with a few improvements and tweaks. The twist rate of the barrel was increased for improved accuracy and the frame was strengthened. These are still really hard to come by and most I have seen were selling far above retail due to the popularity and scarcity of them right now. The one pictured has been equipped with a Burris FastFire II red dot sight a tactical light, and a flash suppressor installed in the threaded barrel.